My first "real" peak. A former colleague of mine from Germany mailed a couple of months ago and asked whether I was interested to cross the 4000m line with him. Not a question really - I'd have gone if he had asked for 8000m ;-) We chose the Lagginhorn in the Wallis alps. It is considered an easy peak and you can avoid crossing a glacier which is a good idea if you are a rope team of only two. We did the whole trip "by fair means" which, according to our definition, means not taking advantage of any civilization amenities like cable cars or staying at huts. So we carried our bivouac equipment and set up a bivvy at 2900m. Beautifully clear night sky with a gazillion stars. A stark contrast to the light polluted valleys. For our first day on the mountain we did an acclimatization via ferrata trip to the top of the Jägihorn (3206m). I have done quite a few via ferratas in the past, but this one was humbling. A lot more difficult than expected. Especially so since Jaron and I tried to avoid any artificial climbing aids. That worked for most of the route but some parts were a bit too daring to attempt without. The route also features a quite spectacular rope bridge spanning the gap between two peaks. Very exposed. On summit day after another bivvy we woke up in the dark at 5 in the morning and climbed out of our frozen (!) sleeping bags. A quick breakfast and we started the ascent over the west ridge via some easy block climbing in the unsteady light of our headlamps. The mountain was friendly to us and presented itself in gorgeous weather. The firn fields towards the summit were frozen solid and easy to negotiate with crampons and ice axe. We reached the peak at 10:20 and enjoyed breathtaking (the air is thinner up there ;-)) 360° vistas. After that we descended 2600m back to base and enjoyed a well deserved beer. The next day was spent climbing in a canyon carved out by the river right next to our camp ground. Perfect granite rock and very nice routes. Unfortunately we didn't have a guide book for the wall and so had to guess which routes were doable and which were too hard. We managed quite OK but had to climb some rescue missions for our climbing gear. Another interesting feature of that particular canyon turned out to be the power generation station at the top of the river. The creek would randomly swell and flood our belaying spot. Returning home Tobias and Christiane were waiting for me in my apartment, spending the last leg of their vacation trip in Switzerland. 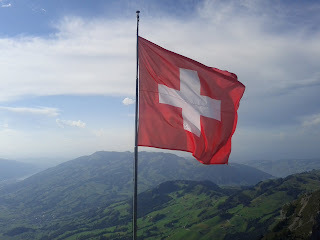 I gave them the Google office tour and took them up the Grosse Mythen (1898m).